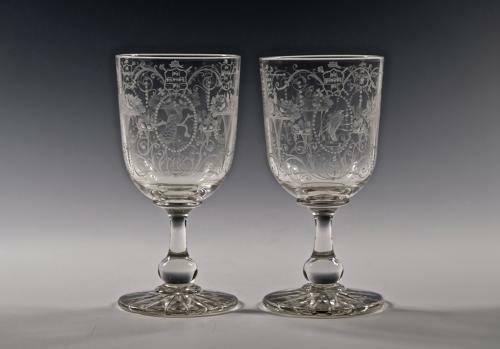 Fine pair of engraved goblets English 1884. Pair of goblets the bowls profusely engraved with epergnes, floral sprays and three oval cartouches containing a herron, peacock and another unidentified bird. Hidden in the engraving is an armorial, the initials CM and the date Sep 20 1884. English 1884. Note: A fine pair of very well engraved goblets.